Phryne Fisher’s life has grown boring. Perfectly… boring. Her household is ordered, her love life is pleasant, the weather is fine. And then a former lover, knocks on her door, begging assistance. He works for Farrell’s Circus and Wild Beast Show, where suddenly animals are being poisoned and ropes sabotaged. 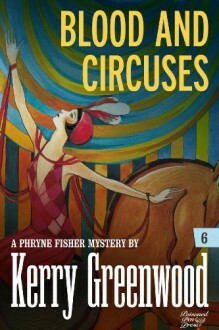 The injury of a trick rider provides Phryne the perfect cover to join the troupe, and to exercise her equestrian skills.Abandoning her name, her title, her comfort, and even her clothes, Phryne must fall off a horse twice a day until she can stay on. She must sleep in a girls’ tent and dine on mutton stew. And she must find some allies. Mr. Christopher, the circus' hermaphrodite, has been found with his throat cut, making it all-too-clear how high the stakes might be.